On Monday, September 18, 2017, the Verdigris Ensemble had its first rehearsal for our inaugural season. It’s actually happening. We have enough start-up funding in place. 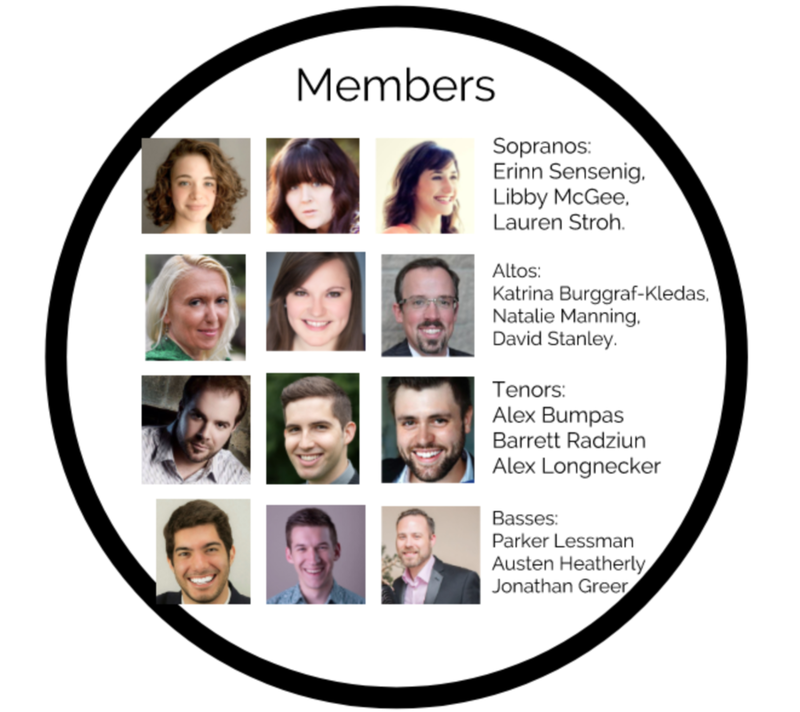 We have a twelve-singer roster contracted for our first series. This is real. At a season launch event held at Raguet and Tom Hall’s house at the beginning of the month, Sam unveiled the roster for this first concert series. Many of these singers will also be joining Verdigris for other concert projects this season. Check these awesome folks out! Jordan DeRouen will be playing piano for our rehearsals and concert. He is the organist at Canyon Creek Presbyterian Church, and also accompanies at North Forney High School and Brown Middle School where Sam is head director. He took this gig at short notice after schedule conflicts caused a previous pianist to drop out, and we are so grateful to have him joining us. 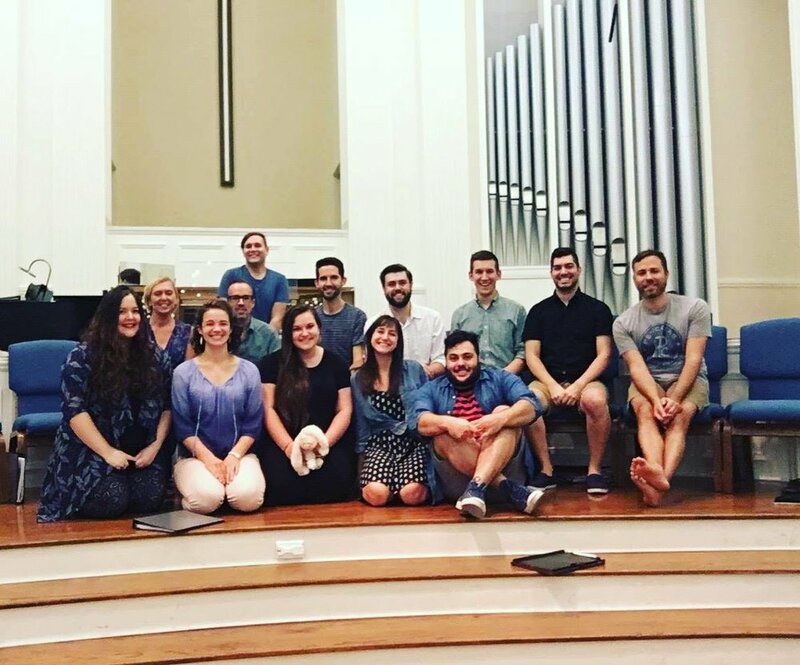 As the fourteen of us (singers, pianist, and Sam) arrived at Royal Lane Baptist Church, our rehearsal venue, we saw familiar faces and made acquaintance with new friends. Several members remarked that the singers are all, without exception, friendly and easy to work with. In the world of performers, large personalities abound, and we happened to capture some of the most loving, creative singer personalities in Dallas. Sam brought his Velveteen rabbit along to serve as mascot as he led the group through the program concept. The concert centers around the story of the Velveteen Rabbit, a beloved children’s tale. A narrator will read the book to the audience, and a synth artist and the choir will provide musical underlay, reflection, and commentary as the story unfolds. Sam described the synth interludes as a bit of nostalgia recollecting the warm electronic accompaniment found on many a childhood audiobook cassette. After opening up our scores for the first time and hearing the sounds of this particular combination of voices, we all felt something worthwhile emerging. Even after one rehearsal, there’s a cohesion of sound that made Sam and the ensemble excited for the musical moments this season holds. If you haven’t yet, please purchase your ticket for this first concert series. We also are still earnestly soliciting financial support at any level. Please visit the Support Us page for more detailed information.